The pod is visible directly under the orange flower. If the pods are ripe, when they are bumped they split open and seeds go flying in all directions. I remember when I was a kid I'd enjoy seeing chain reactions go off when the seeds from one bursting pod would hit other pods, causing those to split open. It's pretty odd to see. Now that I have a picture of the plant, it was easy enough to look up in my Audubon Field Guide to North American Wildflowers. 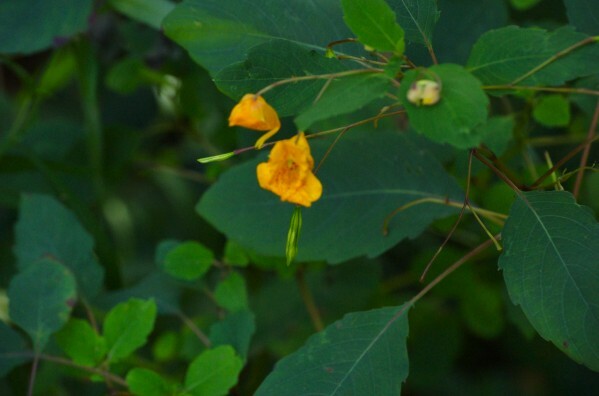 It's called a Spotted Touch-me-not, or Jewelweed. According to the field guide, "the stem juice of the plant is said to relieve itching from poison ivy and has also been used to treat athlete's foot. Scientific data confirm the fungicidal qualities." I guess the scientists are still debating the anti-itching qualities. The kids love to make them explode. There are quite a few growing along the railroad walk in New Hampshire. Oh! Those plants with the clover-shaped leaves are another one I was trying to describe to my friends on the hike. I used to eat those plants when I was a kid. They tasted kind of sour, if I recall correctly. Even the pods tasted pretty good. I think mom or dad said they were ok to eat. I don't remember EVER telling you they were okay to eat! Clover, yes. Ha! Well someone told me it was ok to eat. And look here. I'm pretty sure that's the clover-like plant I was referring too. It's called wood sorrel and according to Georgetown University, native Americans used to eat it. Just don't eat too much. It's bad for your kidneys. Sorry, mom, but I seem to remember you saying they were okay to eat, too.....I remember them tasting sour also. Maybe you said we could eat clover and as kids we thought that meant anything with clover shaped leaves????? Yeah, that might explain why when I was only 4 or 5 years old I was "accidentally" left behind home alone when the family went to Rocky Point. Though, it probably would have been a more successful strategy to bring me to Rocky Point and then forget me. My friend said that he had some plant that was sour when you chewed it and his mom said it was ok to eat too. When we found it it did taste sour and was clover shaped.